Congrats to Ben Winsor, who has taken down the WPT500 at Dusk Till Dawn, the inaugural event of the partypoker WPT UK Festival of Poker. Winsor (pictured here with DTD founder Simon Trumper) has had a lucrative 12 months; last November he won the 2015 Grosvenor UK Poker Tour Grand Final.for £178,600 There were 1,835 players for the £550 buy-in WPT500 which had five start flights at Dusk Till Dawn and seven more at various casinos throughout the UK. Yesterday’s £150,000 prize now brings Winsor close to the $1 million mark in live tourney winnings. Along with the other 49 top finishers, Winsor also wins a seat into the £2,200 WPT Main Event which starts tomorrow. 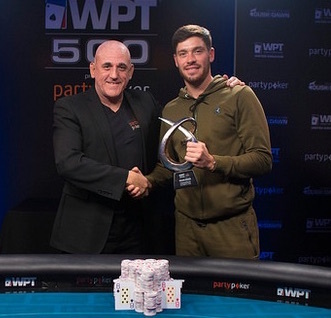 Last season’s partypoker WPT UK Main Event attracted a field of 450 entries with Iaron Lightbourne beating Craig McCorkell heads-up to win the title and £200,000. Also taking place is the £1 million guarantee Devilfish Cup commemorating the life and achievements of the late Dave “Devilfish” Ulliott. It’s Day 2 of the £5,300 buy-in event today which includes a £300 donation. All donations, plus 3% of the prize pool, will be split between the Marie Curie charity, which offers support to terminally ill patients and a trust fund for Ulliott’s daughter Lucy. 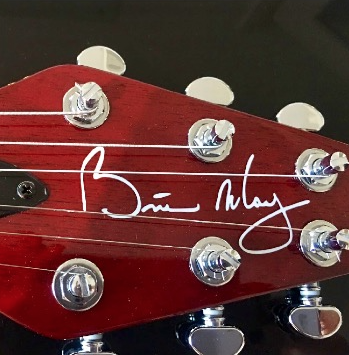 As well as their cash prize, the Devilfish Cup champion will also receive a special edition guitar signed by Queen member Brian May. A special player party is being held tomorrow with a rock band performing some of Ulliott’s favorite tunes.